Braids are a big statement this season. The wedding season has started and we are off to a great start, this season we are still staying with the natural loose hair either up or down, however, there will be many more braids. For a lot of these styles we are still using clip in extensions, the extensions give the hair lots of volume and keep the waves throughout the whole day/evening especially in warmer climates. Bare in mind the month and the weather of your wedding, in Barcelona it is very hot during the months of July and August so I always try to advise my brides to either do a soft up-style (which is very elegant) or down and to the side, so at least you are not getting anxious with nerves and heat. We will be seeing a lot of flower halo´s, I personally like the half or quarter halo and placing the flowers myself, so the bride has a more natural look, working with fresh flowers is one of my favourites, and depending on what flower is in season, you can play with colours and shapes. 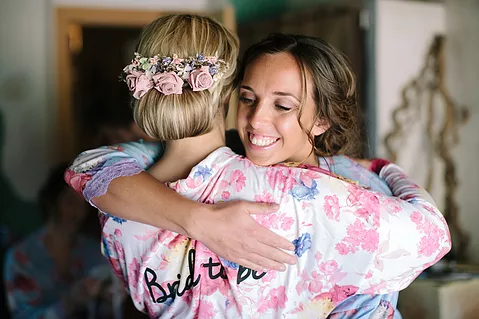 Of course, it depends on what your dress is like, your dress is the focal point so the hair/makeup and hair accessories should work around your dress and what you are trying to create for your big day. Or if you prefer something more classic you can use flowers to give a little fun element. 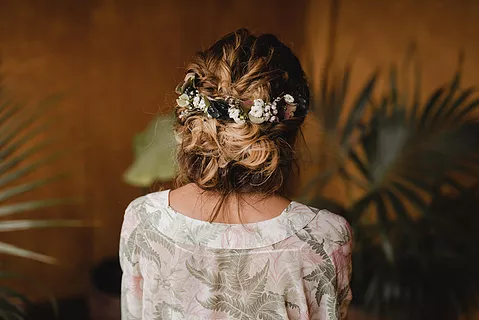 The beachy waves are always a big favourite in Spain because of the weather and the venues, a little bohemian especially if you have chosen places like Cortal Gran for your big day.